Has a God of War feel, doesn't it? I stopped into The Comic Bug (my local comic shop) to sort through the dollar bins recently and I came across quite a few gems. One such stone of beauty I found was Imperial Guard #1. At first glance it just seems like another tie-in to the "Realm of Kings" story line, but after closer examination of the top left corner I noticed that Kev Walker has art duties on this comic of the day. Walker is the current artist on one of my favorite on-going titles, Thunderbolts. Sometimes when people refer to the taste of a certain type of fish they say it tastes fishy. Well, obviously all fish could in fact taste "fishy" since all fish...are fish. But sometimes there are types of fish that people describe as not tasting fishy. Kev Walker's art looks the way comic book art should: not too realistic and not too cartoony. His art is so perfect and fits comics so well, it's quite fishy. But was it always so fishy, or did it once have a different flavor to it? Imperial Guard #1 answers that question for me. 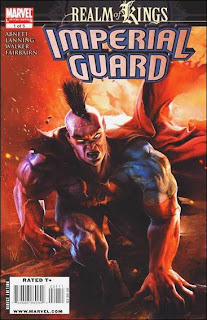 The issue came out about two years ago and features the Imperial Guard of the Shi'ar Empire and the current Shi'ar Majesty, Gladiator (a former guard himself). Though the scenery is space, as apposed to Thunderbolts' Earth, I can still see Walker's style...but not as clearly as I thought I might. The art does not seem as clean or crisp. That may be do to the inking, but there is definitely something rough to the style. Also, the paneling is a little sloppy. Imperial Guard #1 has several panels that are tilted to the side or into another panel and it actually is a pit distracting. Panels should pace the story for a reader while not being noticed. I like seeing the old Walker work (old as in a couple of years, not his early work from the late 80's) because it makes me appreciate his art now. There is a level of respect which I afford artists when their work grows and improves in such a short period of time. The idea that an artist is always trying to improve to meet their comic book perfection is commendable and much appreciated by the fans, like me. Thank you Kev Walker for improving your good art until it reached it's current Thunderbolts status: F-ing amazing (kids read this blog...well, they could).